Astronomers have discovered a galaxy thought to be around 13 billion years old - nearly as old as the universe itself. The small galaxy, described as a “living fossil”, was found in the globular cluster NGC 6752 using the Hubble Space Telescope. Amazing footage from NASA shows the camera zooming in on the “tiny” galaxy, dubbed ‘Bedin 1’, surrounded by thousands of dazzling stars. 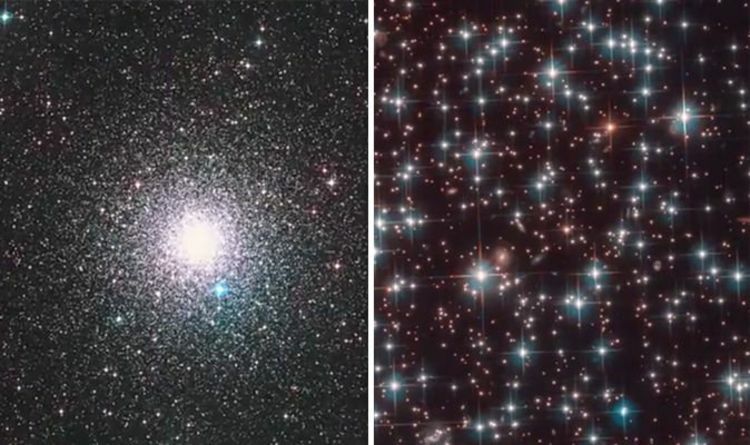 The Hubble Space Telescope team initially planned to determine the age of a globular cluster by measuring its faintest stars, but ended up stumbling upon a small galaxy while doing so. The Hubble Team said: “While dwarf spheroidal galaxies are not uncommon, Bedin 1 has some notable features. “Not only is it one of just a few dwarf spheroidals that have a well-established distance but it is also extremely isolated. “It lies about 30 million light-years from the Milky Way and 2 million light-years from the nearest plausible large galaxy host, NG 6744. The team added: “The discovery of Bedin 1 was a truly serendipitous find. NASA’s Hubble Space Telescope has been peering into the unknown and infinite universe for nearly 30 years. Since its 1990 launch Hubble has continually delivered iconic images of the universe, allowing us to better understand infinite space. NASA’s eye in the sky has now unveiled its most incredible image to date, with the release of the deepest image of the universe ever taken. Astronomers have used a revolutionary new technique to reveal “lost” light in Hubble Ultra-Deep Field images (HUDF). The HUDF is an image of a small region of space in the Fornax constellation, believed to contain an estimated 10,000 galaxies. Researchers at the Instituto de Astrofísica de Canarias (IAC), based in the Canary Islands, have processed a composite of several Hubble images to unveil a revised image of the Universe. The IAC researchers said: “Recovering this light, emitted by the stars in these outer zones, was equivalent to recovering the light from a complete galaxy." Alejandro Borlaff, the IAC team’s project leader, said: “What we have done is to go back to the archive of the original images, directly as observed by Hubble, and improve the process of combination.